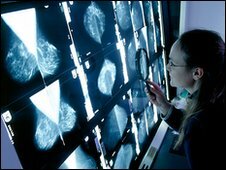 "Blood pressure drugs may be able to reduce the ability of breast cancer to spread around the body, researchers have told a European conference. A joint UK and German study found that cancer patients taking beta-blockers had a lower risk of dying. The drugs may block hormones that trigger the spread of cancer cells. However, experts stressed that more evidence from bigger studies would be needed before the drug could be given as part of routine treatment.